The City of Santa Ana’s annual Youth Water Poster Contest is open to all youth ages 5-18 residing in Santa Ana. The contest provides an opportunity for young people to become more aware of different water topics through artistic expression. Winners receive an award and a Nintendo Switch, iPad or gift certificate! 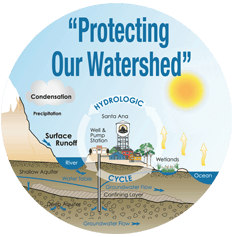 All posters must be drawn horizontally on 12”x18” white drawing paper or poster board and must use the theme "Protecting our Watersheds." Each entry must include an entry form attached to the back of the poster. Please read and follow the Poster Contest Rules carefully. Entries that do not adhere to all poster specifications will be disqualified. ENTRIES ARE DUE BY 4 PM ON THURSDAY, NOVEMBER 29, 2018. Teacher’s packets are being delivered to each SAUSD school administrator for distribution before October 1. Packets are available for each classroom (elementary grades) and for each art teacher (middle/high school grades). You can download the teacher’s packet here. If you wish to incorporate the poster contest into your classroom curriculum, please see the resources listed below. Also, our 2018 Kids Activity Book contains fun activities you can do with your students to make the contest not only fun but also educational. You can order free activity books for your classroom by contacting Robert Hernandez at (714) 647-3341 or via email at RYHernandez@santa-ana.org. In appreciation to teachers who encourage student participation, we are holding a special drawing for teachers with 8 or more student entries from their classroom. 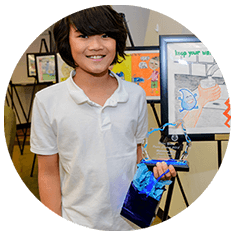 The drawing for a $200 gift certificate from Art Supply Warehouse will take place at the Youth Water Poster Contest Exhibit and Awards Reception in February 2019. This 20-page activity book is filled with facts, coloring areas, fill-in-the-blank slots, word searches and word scrambles that keep students learning about the Water Cycle, their local watershed and how they can protect it. You can download the activity book here.